The Ponte Vecchio Bridge straddles the River Arno in the heart of Florence. It was first documented in the year 996 and is believed to have been built during Roman times. Today, the bridge is still a busy hub of activity and a central part of Florentine culture. In the summer of 1944, as the Nazi’s withdraw from the city during World War Two, it was the only bridge to be spared from destruction. This was the result of a direct order from Adolf Hitler who wanted to “preserve” the beauty of Florence. The bridge was originally lined with butcher’s shops, but in 1565 with the construction of the Vasari corridor above it, the butcher’s shops were replaced by the more prestigious Jewellery stores that still remain today. At the centre of the bridge, among the crowds of shoppers, tourists and street entertainers stand a Bronze bust of a man possibly in his late fifties, with a long beard and eyes boring out across Florence, and an expression that is hard to place; somewhere between hate and love, but the line of distinction is very blurred: This is Benvenuto Cellini. Musician, writer, painter, self-confessed murderer and the greatest silvers and gold-smith the world has ever seen, Benvenunto Cellini was born in Florence in 1500 and would prove to be one of Florence’s most colourful sons. His Father was a musician and instrument builder and was keen for his son to continue in the family trade. When Benvenuto pushed his father to allow him to take up art studies, his father curtly informed that he did not want him to practice any other art except “playing and composing”. 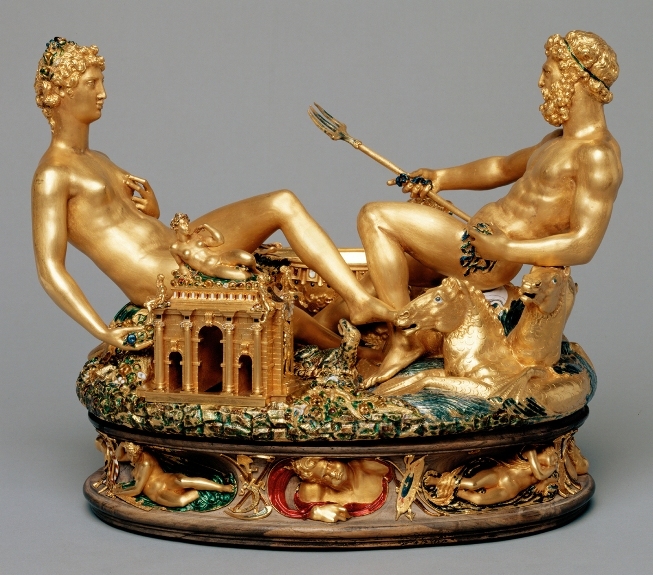 By the age of fifteen his father relented and allowed Cellini to be apprenticed to Florentine Goldsmith Antonio Di Sandro with condition that he also continued with his music studies. However, this was short lived as his involvement in a brawl forced the young Cellini, along with his younger brother Cecchini, to flee Florence to escape punishment by the authorities. Cellini would become an accomplished flute player, but admits in his biography, written in 1558, that he only practised music to “appease” his father and that his real passion was his art which he continued to practise during his exile from Florence. For Cellini, it seemed that trouble was waiting at every corner. On his return to Florence he would be given part of the shop owned by goldsmith Gioanbattista Soglian in the Mercato Nuovo (new market) next to Piazza Della Signoria, but after an altercation with some jealous rivals Cellini would again be called before the authorities. This time, after being ordered to pay “four measures of flour” Cellini flew in to a rage and after escaping the eyes of his guards would return to the house of his assailants brandishing a knife. Although no one was hurt, and with the help a “good friar” he met outside Santa Maria Novella, Cellini would again flee Florence. Escaping to Rome, he found favour with Pope Clement VII after he had been shown some of the wonderful silverworks he had produced for the Bishop of Salamanca. When Charles III, Duke of Bourbon invaded Rome it was Cellini who, after shooting Philbert of Chalon, Prince of Orange, would claim to have also killed the invading Duke. In his own words it was he who “saved the castle that morning”. This act of bravery brought forgiveness for his earlier crimes in his native Florence, but in true Cellini fashion, things didn’t stay quiet for long. After completing works which include Hercules and Nemean Lion, Cellini would, again, leave Florence for Rome. He found work with the Pope, making medal for the papal mint as well as taking private commissions, until in 1529 tragedy struk. Cellini’s brother Cecchini, who was in Rome serving Duke Alessandro, was shot after killing a Corporal in the Roman watch, and later died of his wounds. Cellini, in an act of blood revenge tracked down and avenged his brother’s killer. It was time to move on, he headed for Naples until he managed to obtain a pardon, with the help of Pope Clement VII, and return to Rome. In 1534 the Pope passed away. Just three days after, Cellini committed murder again. However, this was not a spare of the moment act of rage, but a pre-meditated assassination. A goldsmith by the name of Pompeo had been witness to a street brawls, in which Cellini had knocked a man out with a stone. The new Pope, Paul III, on being wrongly informed by Pompeo of the man’s death, ordered Cellini to be “hung at the very spot the homicide took place”. On learning of this, Cellini followed Pompeo through the crowded streets of Rome and stabbed him to death with two blows “between the ears”. Before long he would find himself imprisoned in Castel Sant’Angelo in Rome, but not for his mounting homicides, but for allegedly stealing jewels from the Pope’s gown. He was finally released after the intervention of Cardinal D’Este: who he repaid with a beautiful silver cup. Whilst in France when a lawsuit was placed against him, Cellini settled out of court by means of “a great dagger”, and “deprived him [the plaintiff] the use of both of his legs.”. Back in Florence his past crimes were soon forgotten and he was named a member of the Accademia delle Arti del Disegno by the legendary painter and biographer Giorgio Vasari. This great honour would represent one of the highest point in the life of Cellini’s career and a mark of great respect by his fellow Florentines. Despite Cellini’s fondness for dealing with his problem with the sword or dagger, he is a man very hard to dislike. His biography, finished in 1563, is full of grit, determination and a true passion to succeed in his art: whatever the circumstances. It has to be remembered that Cellini lived in a time when arguments could very easily turn into duels and frequently did. He was a deeply religious man; a man who believed that he was on the side of righteousness and that murder was just part of life. He showed tremendous love for his brother and father, and frequently mentions them between the pages of his biography. Being chosen as a member of the Accademia delle Arti del Disegno shows the respect he commanded: not just as an artist but as a patron of Florence. When he died in 1571, at the age of 70, he was buried with great honours in the Church of the Santissima Annunziata. The man who had so much admired Michelangelo, and copied his painting as a child, had maybe become more like him than he would have ever realised. He left behind many masterpieces, now scattered from France to Vienna, but surely his most crowning achievement stand right in the Loggia dei Lanzi gallery in Piazza della Signoria in his beloved Florence: the Perseus with the Head of Medusa. Legend says that he would throw books, chair and even tables from his own house into the furnace to raise the temperature enough to melt the bronze needed for the sculpture. If ever proof of dedication was needed! The statue was removed from the piazza in 1996 for a long restoration project that lasted several years, but has since been returned to take its rightful place: just a stone’s throw away from where Michelangelo’s (original) David once stood. For all his faults, Benvenuto Cellini remains a hero of Florence, in the Piazzale Degli Uffizzi, outside the famous Uffizi Gallery, a life size sculptor of him stands alongside the great masters of renaissance art, Da Vinci, Rafael and, of course, Michelangelo . It seems that the image he projected of himself was not one looking for self-justification, or even to heighten his reputation, but simply of a man who saw the world in black and white…and gold, silver and bronze.